What makes this book so special? It's the fact that it simplifies cooking to a basic ratio. Think of bread: bread is just 5 parts flour and 3 parts liquid plus the extra ingredients like yeast, salt, sugar, etc. You can even make your own pasta using the ratio of 3 parts flour and 2 parts egg. The book has ratios for doughs, sauces, batters, etc. This book has changed my approach to cooking because I now think of recipes as a basic ratio and I can customize it however I want by adding additional ingredients to add to the flavor. It's the one cookbook I'm constantly going back to because everything that was once daunting now appear simple in cooking. This is a great book for the novice cook. More than anything else, it has made cooking less scary for me since cooking boils down to a ratio and a few basic steps. You will now have the confidence in yourself to tackle cakes, pies, breads, etc. Never have I ever imagined that I can make my own homemade bread, but with a simple ratio and a few ingredients I have the ability to make a ciabatta bread or a good pie crust. 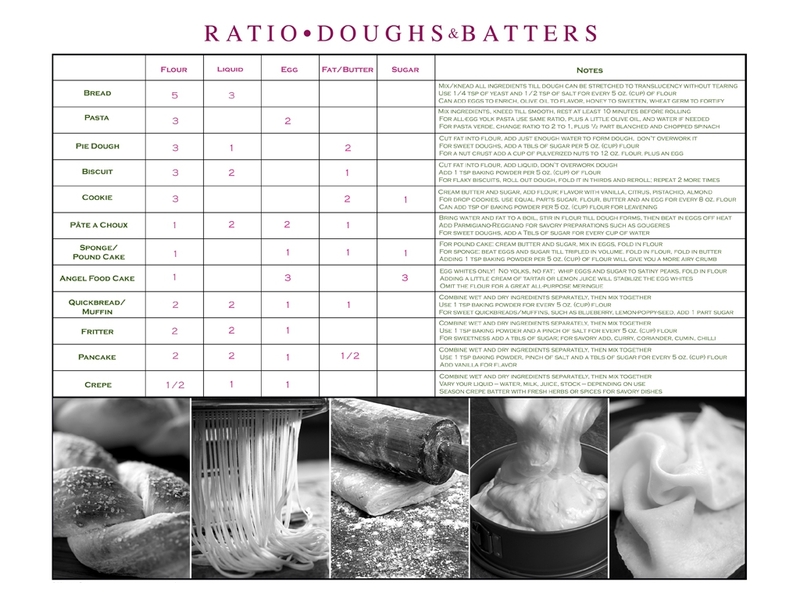 Below is a sample chart by the author which outlines some ratios for common foods. One of the things that is necessary if you're going to be integrating these radical ideas into your cooking repertoire is to have a food scale. Since you're putting your faith into a ratio, do yourself a favor and get a good food scale. I love the food scale that I have because it is digital, has zero-out feature (so you can keep adding more and more ingredients to 1 bowl = less dishes to wash), and can measure in both ounces and grams. A food scale is essential since the amount of, say, flour could vary in 1 cup depending on how packed in it is. Not having a good food scale can make your measurements inaccurate and send the whole premise of the ratio out of whack and what will you have to show for it? You'll not only have a dense bread (for example) but you'll also have total anarchy in your kitchen!...food won't taste as good, things will take longer to cook, meals that were once tender and savory are now dry and bland, and countless other things I dare not mention. Remember, the all important ratio is useless without it's buddy, the food scale.